As we enjoy the longest sustained period of hot weather in history [possibly not true - Ed] the time could be right to - shock horror - step out of your music room, rehearsal space or bedroom studio and into the real world. But when you do come up for air, the last thing you want to do is venture out without some kind of speaker on which to play your tunes, preferably a super-mobile and wireless one. Step forward the Mini Rigs Mini Portable Bluetooth Speaker, a puck-shaped solution that can kick out 15 watts of power and offers up to 30 hours of battery life (10 hours at an average volume). Designed and built in Bristol in the UK, this comes with a companion app that enables you to adjust its settings and EQ, and also features a 3.5mm input so that you can plug in non-wireless sources. Small enough to fit in your pocket, the Mini is made of anodised aluminium which means that it’s built to last. Its splash-resistance means that using it on the beach isn’t a problem, either. 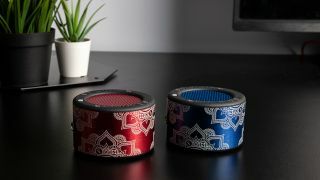 The Mini Rigs Mini Portable Bluetooth Speaker costs £99.95, but you could win one of the two custom-engraved units that are up for grabs by completing Focusrite’s online survey below. It doesn’t matter what kind of musician you are or whether or not you record - Focusrite wants to hear from you. You can click here to complete the survey. Terms and conditions are available on the Focusrite website.